Two Emory microbiology/immunology labs working from two different tacks each have yielded substantial new insight in the search for better flu vaccines. 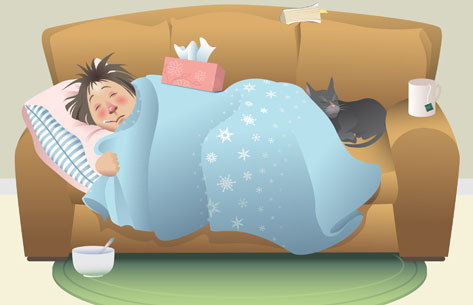 What both labs have in common is a focus on components of the flu virus that remain relatively constant from one viral strain to another. Stalk region of the virus—Researchers in Rafi Ahmed's lab, for example, sought to examine immune responses in several patients who had had the 2009 strain of H1N1. They discovered that the patients had antibodies that could fight a wide variety of flu strains, including all the seasonal H1N1 flu strains from the past decade, the Spanish flu strain of 1918, and a pathogenic H5N1 strain. Some of the antibodies the team identified stick to the "stalk" region of the virus, which changes less than other regions. Because of its relative constancy, scientists have long eyed this part of the virus as the possible basis of a vaccine that could protect broadly against many flu strains. "These broadly protective, stalk-reactive antibodies previously were thought to be very rare, but in the patients we studied, they were surprisingly abundant," says Jens Wrammert." The group's findings help point the way toward producing a vaccine that could provide more or less permanent immunity to all flu. Having such a vaccine would eliminate the need for scientists to develop a new flu vaccine each year and for populations to be immunized each year. M-2 protein—Around the same time that Ahmed's group published its findings in Journal of Experimental Medicine, researchers in Richard Compans' lab published their own surprising findings related to flu vaccine in Proceedings of the National Academy of Sciences. Their research focused on M2, a viral protein that changes relatively little compared with other parts of the virus. Although it has long been a protein of interest in flu vaccines, M2 has not proved to be much of a vaccine by itself. Compans' group works routinely with virus-like particles (VLPs), which look like viruses but can't replicate. The team incorporated M2 into VLPs and then combined the M2 VLPs with a vaccine made from a standard laboratory viral strain of flu. In mice immunized with this combination, the group achieved immune protection against the 2009 H1N1 pandemic flu strain and against an H1N5 strain from Vietnam. Like the work in Ahmed's lab, these results also help point the way to a means of overcoming the limitations of current strain-specific seasonal flu vaccines to develop a vaccine universally effective against all flu. Read more about the research in the Ahmed and Compans labs. A new Emory center aggregates researchers exploring how brain biology influences normal social behaviors and social disorders. Scientists in the Center for Translational Social Neuroscience (CTSN) are focusing on new treatment strategies, including new drugs for improving social function in psychiatric disorders such as autism spectrum disorders and schizophrenia, in which social disruption is a core symptom. The CTSN also will provide training opportunities for those wanting to pursue neurobehavioral research. The center is directed by Larry Young (chief of behavioral neuroscience and psychiatric disorders at Yerkes), and its members include Frans de Waal (director of the Living Links Center at Yerkes), Ami Klin (chief of the Marcus Autism Center and Georgia Research Alliance Eminent Scholar), and Stephen Warren (chair of genetics in the medical school). The scientists will explore the neurobiology of pro-social behaviors, including cooperation, compassion, bonding, and social reciprocity, using tools in genomics, cellular biology, systems neuroscience, and behavioral biology. They will create a pipeline from rodent models to nonhuman primate models to identify new drug therapies. "The CTSN will foster intellectual exchange and collaboration between basic and translational researchers and clinicians at Emory and across the Atlanta community," says Young. Read more. Dean Thomas Lawley recently established a scholarship fund for medical students in honor of Claudia Adkison, who stepped down from her position this past summer as the medical school's executive associate dean. Adkison and her husband, John Shullo, have bequeathed their entire estate to the fund. Adkison served in administration for 15 years and before that as a faculty member in cell biology. In that role, she was recognized as an excellent teacher, with numerous teaching awards. "I would like to build this fund to support as many students as possible," Adkison says. "I had and continue to have many wonderful, close friendships with my 2,500 medical students. When they entered the door, I already knew every name and tried hard to form a personal relationship with as many of them as I could, and I have followed their careers with much joy and pride." One of her students, Bill Eley, is now Emory's executive associate dean of medical education and student affairs. "When I attended medical school, Claudia was a shining example of a teacher committed to our learning," he says. "She put extraordinary effort into her lectures. What made her our most cherished first-year professor, however, was her willingness to spend hours with the class outside of normal hours to review our histology and cell biology material." 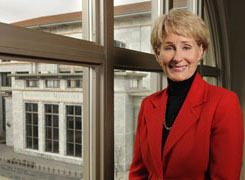 Adkison continued her teaching and research at Emory while she pursued a law degree. She then entered private practice as an intellectual property lawyer before she was convinced to return to Emory in 1995. She has worked tirelessly on the school's behalf. To name a few of her accomplishments: serving as course director for the medical school's cell biology and histology course for 17 years, as president of the University Senate for two terms, and as chair of the University Research Committee for many years; establishing the nine-year tenure clock; creating the faculty development policy and an office for faculty development; establishing "chair school" for new department heads; writing the first conflict of interest policies for the university and medical school; facilitating some of the medical school's international activities such as the vaccine center in New Delhi; and most recently, leading the school in updating its policies on industry relationships. Adkison will continue to serve as a consultant on special projects for the dean. Without the efficient management of data and information, an academic medical center would drown in a sea of numbers and letters. Universities across the country increasingly recognize the impact of knowledge management to the success of the life sciences enterprise, and the Woodruff Health Sciences Center Library has started a number of initiatives to stay ahead of the information curve, says Sandra Franklin, library director and current Woodruff Leadership Academy fellow. The WHSC Library has three clinical informationists on staff who work closely with medical residents to find the best published evidence to answer clinical questions that arise from resident reports at Emory University Hospital, Emory University Hospital Midtown, and Grady Hospital. 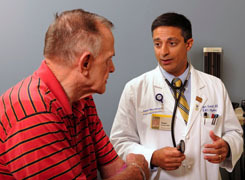 The information is stored in a searchable database at emorymedicine.wordpress.com. The clinical informationists recently worked with Emory Healthcare nurses to create ehcnursing.wordpress.com so nurses can easily find published evidence in answer to their questions as well. Now the library has hired a research informationist, Jeremy Kupsco. Kupsco will work closely with study investigators and postdoctoral fellows to select, license, and acquire data storage tools. He'll also conduct training sessions and be available for consultation, all in an effort to save researchers time and provide the most effective resources available, along with how-to instructions, Franklin says. Kupsco previously served as a postdoctoral fellow in Kenneth Moberg's cell biology lab at Emory. His research focus was the role of the tumor suppressor gene archipelago in developing tissues of the fruit fly species Drosophila melanogaster. He received his doctorate in genetics at the University of North Carolina at Chapel Hill. Gifts from grateful patients and their families enable physician-scientists to seek new avenues of research and treatment, but many doctors may be intimidated by the prospect of talking to patients about fundraising. The Woodruff Health Sciences Center is hosting a workshop for physicians that will provide an introduction to philanthropy, including how to recognize a potential donor and foster a philanthropic relationship. "It is important to remember that our grateful patients and their families donate gifts to make a difference, to support the faculty whose vision and research they think will make that difference," says Wright Caughman, interim WHSC CEO. "Patients feel good when their beneficence battles disease, eases despair, and advances medical treatment for future generations." To register, please contact Tanvi Mohan at 404-727-9515 or tanvi.mohan@emory.edu. The most rewarding part of Alison Anderson's job, she says, is negotiating contracts with managed care payers to ensure that Emory Healthcare services—many of which are provided nowhere else in the state—remain available to patients in the community. In such negotiations, Anderson, who is director of Contract and Provider Services in Emory Healthcare, must maintain a delicate balance—leveraging Emory's strengths with payer demands and keeping the financial equation viable for all parties involved. Trained as a nurse, Anderson moved quickly to the interface between provider services and insurance back in the old fee-for-service era. Since joining Emory Healthcare 16 years ago, she has been an active participant along the way in the continual evolution of the health care market. Her office is part of Emory Healthcare Market Services, an expanded version of what used to be called Managed Care and still headed by Patrick Hammond, chief market services officer, to whom Anderson reports. Among earlier jobs, she was responsible for growing the number of contracts for Emory's transplant program, with transplants now covered by all major payers. Managed care currently represents 39% of Emory Healthcare's payer mix, most of this business concentrated in six major payers, listed here in descending order of volume: Blue Cross Blue Shield, UnitedHealthcare, Aetna, CIGNA, Coventry, and Humana. Within the past five years, both Medicare (the second largest source of payer reimbursement for Emory Healthcare behind managed care) and Medicaid have become increasingly "managed." Eighty percent of the Georgia Medicaid population now falls under a managed Medicaid plan, and an increasing number of seniors are changing from traditional Medicare to Medicare Advantage plans (managed Medicare), offered through commercial insurers. In managing some 90-plus managed care contracts, Anderson and her team work daily with all Emory Healthcare business offices to ensure that payers are complying with their contractual agreements regarding contract terms and claims payment. Anderson’s team orients internal physicians and business departments to new contracts and assists with contract interpretation during claims disputes. Before Anderson can negotiate contracts, she and her colleagues must develop and implement contract strategy, an effort that promises to become more complicated as Emory Healthcare works to help shape the landscape in the context of health care reform. For example, she's currently working on a new contract for a patient-centered medical home, which will involve a new model of care and reimbursement. "We work as a team," says Anderson, referring to a group of five. "We see ourselves as a key partner to the different specialty sections and business entities of Emory Healthcare. We help our physicians and hospitals maintain contract access for their patients so they can continue to provide the high-quality care Emory is known for and be appropriately reimbursed for their services." When forecasters predicted winter weather last month, few of us anticipated the severity and duration of the storm that would soon hit us. 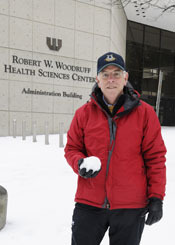 When we woke that Monday morning to one of the worst winter storms in Atlanta history, the Woodruff Health Sciences Center faced some tough decisions. How would we continue to provide the best possible care for people in need when the entire metro area was at a virtual standstill? As always, the answer lay with our people—the extraordinary faculty and staff who kept us up and running in spite of the challenges presented by the weather. Emory Healthcare staff braved the elements to ensure that our patients would continue to receive the high standard of care they expect and deserve from us. Many slept here on campus for days in order to be accessible to their patients. Those with four-wheel drive shuttled their stranded co-workers, and others braved the icy conditions to walk to work—including one inventive nurse who found a new use for her golf spikes! As a result, our regular patients, along with the many more who were injured as a result of the weather, continued to receive uninterrupted care. For example, Emory’s dialysis centers were the only ones across the city that remained open throughout the week. Kudos to John Fox and all the leadership team of Emory Healthcare, who led this colossal effort by example, but most of all to the dedicated health professionals and staff whose commitment to top-notch patient care was never more evident than during this crisis. Of course, it wasn't only Emory Healthcare that made an extraordinary effort to keep the lights on during Deep Freeze 2011. Every unit in the Woodruff Health Sciences Center has its stories of employees who showed initiative and ingenuity in keeping their area operational under challenging circumstances. From the folks who continued to feed and care for the animals at Yerkes to the administrative staff who worked around the clock scheduling and rescheduling meetings to our intrepid WHSC photographer who was out in the weather all week capturing once-in-a-lifetime images, we all pulled together to turn crisis into opportunity. I couldn't be more proud of the entire WHSC family. The weather may have been icy, but you were on fire! Thanks, as always. Please let me know your thoughts and suggestions at evphafeedback@emory.edu. Patient Kevin Jordan and Emory surgeons Allan Kirk and Ken Newell talked to dozens of national and local media outlets on Feb. 9 about Jordan's kidney transplant at Emory Hospital on Feb. 7. 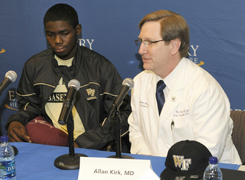 Jordan, a student and baseball outfielder at Wake Forest, received a kidney from his coach, Tom Walter. Jordan had ANCA vasculitis, an inflammation of the blood vessels that accounts for less than 5% of kidney failure worldwide. Newell expects him to make a full recovery in about two months. The American Medical Student Association recently gave the School of Medicine an "A" on its conflict-of-interest policy. Just 19 out of 152 schools received such a high mark. One of the topics the 2011 class of the Woodruff Leadership Academy (WLA) will hear about this term is relevant to almost everyone at some point in their career: requesting funds. The presentation by Gary Teal, Woodruff Health Sciences chief administrative officer and WLA dean, is one of many designed to give Emory's emerging leaders the skills and knowledge to strengthen their leadership potential. The semester-long WLA course taps employees from across health sciences, such as Yoko Hammond, associate director of finance at Yerkes, and Melissa Alperin, director of the career MPH program and senior associate in behavioral sciences and health education at Rollins School of Public Health. WLA presenters include WHSC and university leaders, faculty from Goizueta Business School, and several local CEOs, with topics ranging from finances and leadership styles to conflict negotiation, collaboration and influence, and quality initiatives. Dwain Blackston (pediatrics and genetics) received the Leila Denmark Lifetime Achievement Award from the Georgia chapter of the American Academy of Pediatrics. For more than three decades, he has served as chair of the Georgia chapter's committee on children with disabilities. Tim Buchman (director, Emory Center for Critical Care) received the Distinguished Investigator Award from the American College of Critical Care Medicine. Maureen DeBlois is chief administrative officer for Emory Specialty Associates, an outreach physician group practice organization managed by The Emory Clinic. Previously, she was EVP of Saint Joseph's Medical Group, VP of physician practice at Children's Healthcare of Atlanta, and VP of physician services at WellStar Health System. Veda Johnson (pediatrics) received the 2010 Big Voice for Children Award at the Voices for Georgia’s Children organization. Johnson has spearheaded the concept of school-based health clinics in Atlanta since 1994. Kamal Mansour (surgery) received the Inspiration Award from the Southern Thoracic Surgical Association for cultivating upcoming generations of cardiothoracic surgeons. He is only the second person to receive this award. 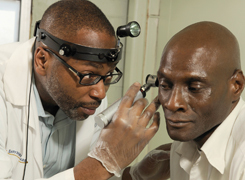 Charles Moore (above, otolaryngology) received the 2011 Pride in the Profession Award from the American Medical Association for his work with underserved populations. Feb. 13: Think Pink Game benefitting breast cancer, between Emory's women's basketball team and University of Chicago. Woodruff Physical Education Center, 2 p.m.
Feb. 24: 2011 State-of-the-WHSC address. 4:30 p.m. WHSCAB auditorium. Simulcast to Emory Johns Creek, Emory University Orthopaedics & Spine Hospital, and VA Medical Center. Reception to follow. Separate presentations at Emory University Hospital Midtown on March 1 and at Grady on March 8. Till March 25: The Life and Legacy of Robert W. Woodruff. Exhibit at Schatten Gallery, level 3, Robert W. Woodruff Library. April 26: Future Makers Lecture. William Stead. 5 p.m., WHSCAB auditorium. April 27: 2nd Annual Greening Healthcare Conference. 8 a.m. to 1 p.m., School of Nursing auditorium.